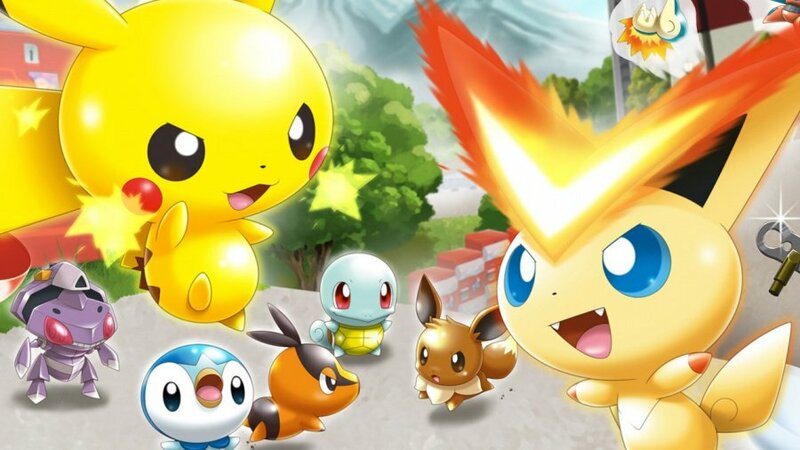 A physical version of the free-to-play 3DS eShop title Pokémon Rumble World is coming to Japan on November 19th, it has been revealed. The game will feature none of the microtransactions seen in the digital release and will give players all 3,000 Poké Diamonds and the Poké Diamonds Digger from the outset. It would seem that this version is being published primarily to tempt in new players, as it isn't possible to transfer save data between the eShop edition and this new retail release. The game will cost 3,700 Yen. There's currently no word on whether or not this will be coming to the west as well. If they released this version first and the P2W version later, I might've fallen for it. But the insane lack of content and the fact that it still is available for free (technically) on the e-Shop, makes this a horrible deal at full retail price. Especially with Pokémon Rumble Arena 3D being available dirt cheap, and still being way better than this game. I paid out for all the features pretty early on and have enjoyed it for what it is. 140 hours of play and just about finished all the challenges. This felt a bit more like free-to-start than pay-to-win as the cost was okay considering how much time has been spent playing it. Honestly not aware of other games like this but I'll have a look now. I really like this game I've had alot of fun playing it, this title got me to go purchase my first Pokemon title Alpha Sapphire and now I'm a huge Pokemon fan .., Mission Accomplished Nintendo . Rumble World is a great game I'd recommend it I even thought the free to play model for it is really fair . That's pretty neat, to be honest I already felt like it was basically a full retail game once you get around to buying the full 3000 poké diamonds. I stopped playing Rumble World after a month or two because unlocking new stages was so slow and I didn't want to spend money on diamonds. I think I'd give it another try if it was released as a retail game and it'd be cheaper than buying 3000 diamonds. I enjoy Shuffle much more and still keep playing it at least once a week even when there isn't much to do. I think I bought around 1500 diamonds total...but I honestly can't see myself buying more. Even if it came out as a full physical release in the west I see myself skipping it. Sure it is fun, but the story mode is suppppppppper short. I still find myself using the lucky balloon every day, but that's about it. Well that seems like an odd choice. in Japan in particular with all their smart device usage. Only rationale I can really think of is parents not letting little kids download games onto their 2DS, but Japan never got the 2DS. Well I suppose it could still make a nice holiday gift for a few relatives to give to some kids. Will be interesting to see if it shows up in the top 20 when it releases, then we'll know. This is a nice thing to do with the game. You pay less for the 3,000 diamonds and you have the digger. This makes parents not worry about micro transactions within the game. I would get this. But I have bought most of the diamonds and caught almost all pokemon. But if this sells well we may get more games. I hope they do add multiplayer, this seems like a good time to implement it. I stopped playing this ages ago because unlike Shuffle, there isn't a reason to come back everyday. I'm very happy they are doing this. I'd much rather buy a complete, real game at once than buy it bit for bit or worst of all, one life at a time. Good move! If it releases in Europe I will buy, if nothing else to support the release of real games instead of pay to win crap. I would actually buy this if they release a full retail edition with no microtransactions. I thoroughly enjoyed Super Pokémon Rumble, so this was a HUGE letdown. I'd rather have paid the $50 or $60 upfront and been able to complete the game without having to be frugal about my in-game spending. Kinda reaffirms the idea that the game is more of a retail download you pay in chucks. @James_mussell98 Pay to win. Go look up Candy Crush and you'll see what I mean. @James_mussell98 Pay to Win. I'll assume you know what I mean by that. @Captain_Gonru - "not letting you move over your save"
Have you ever tried to back up your saves on the Wii U? If you want to back up an easy to find small simple save from any downloaded game - say Windwaker HD or Disney Infinity - you need to back up the entire game file, all 11GB in the case of DI to back up your save. And then when you want to put it back, say you ron board Wii U save got accidentally deleted, you need to put all 11GB back. USB is fast, but it's not instantaneous. And the Wii U only uses 2.0, not 3.0 which is 10x faster. So no, Nintneod messing up a simple save file procedure doesn't surprise me in the least. In this case though there thinking may be along the lines of - if you already have it for free, why pay for it? More importantly, if you did buy it, played it, got pretty far, downloaded the game for free, transferred that save over, you could then resell the cartridge w/ your partly done save to somebody else, and they may not be able to figure out how to know which on console save goes to which on cartridge save. So they may be worried about pirating, b/c they always seem to be more worried about pirating then helping their paying consumers out. Sony's justification for proprietary high priced memory for Vita which probably killed sales as much as anything. Uuuh, why is that a "of course"? Retail titles can have micro-transactions too? !